If you're feeling dirty or you are feeling guilty and need to confess something, cleaning product Greased Lightning has given you a place to air your dirty thoughts on a site called Filthy Confessions. On the site you can write or phone in your confession and listen and read the confessions of others. Visitors who use Blogger can also publish their confession on their blog by entering their username and password. 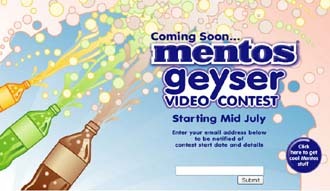 There's also a sweepstakes that offers the chance to win a vacation and the usual send to a friend feature. What? No MySpace page?